Reporting since March 11, 2011 . . . The most amazing fact about this earthquake is the number of strong and less strong aftershocks. 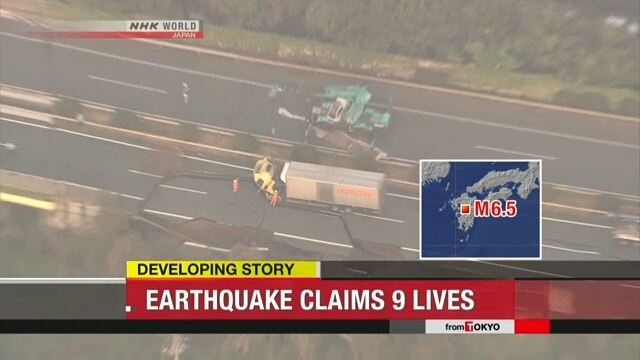 At least 9 people died in a powerful earthquake that struck southwestern Japan late Thursday. Strong aftershocks are continuing and many people have been forced to flee. Strong aftershocks are continuing and many people have been forced to flee. An NHK robotic camera captured the moment when the magnitude 6.5 quake hit Kumamoto City shortly before 9:30PM. 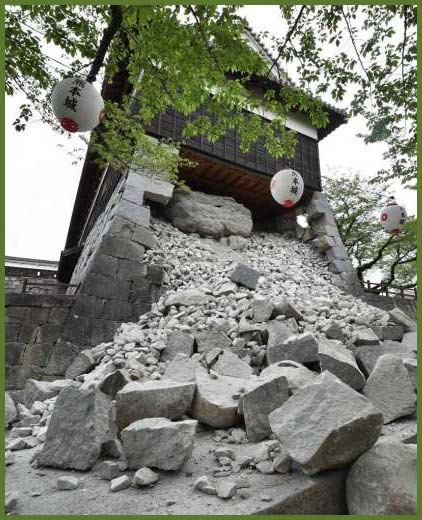 Nearly half of the over 200-meter-long wall surrounding Kumamoto Castle has been damaged. The stone wall is an important cultural asset. 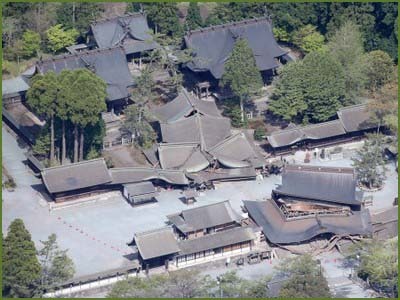 NHK footage filmed how its newsroom near the castle shook violently. Officials at Kumamoto Prefecture say more than 900 people have received medical care. They say one person who died was trapped under a collapsed house. Police say another casualty was reported in a fire in the neighboring town of Mashiki, where the hardest jolt was recorded. Other fires also broke out in affected areas. Over 100 aftershocks are rocking the area, some of them nearly as strong as the first tremor, causing more damage to buildings. Utility companies in the prefecture say more than a thousand households have lost gas and electricity. Officials say more than 30,000 people in the prefecture have fled. Town officials also transferred their emergency operations headquarters to an evacuation facility, because electricity is out, shelves collapsed, and objects are scattered across the floor of their office. The main highway cracked and crumbled over a wide area. Certain sections have been closed. Officials at Japan Railway Company say one of its Shinkansen bullet trains was derailed by the earthquake in Kumamoto city. No one was hurt. The out-of-service train was on its way to a garage. Japan's only online nuclear plant is located in the same region of Kyushu. Officials say there are no irregularities with the 2 reactors at the Sendai plant. They say they remain in operation. 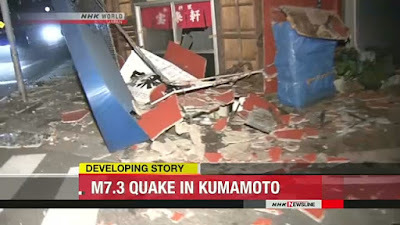 A magnitude 7.3 earthquake has struck the Kyushu region in southwestern Japan, injuring many people. 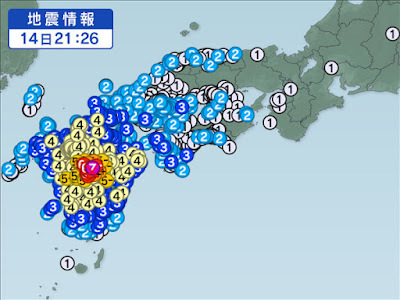 Japan's Meteorological Agency says the quake occurred at around 1:25AM on Saturday. 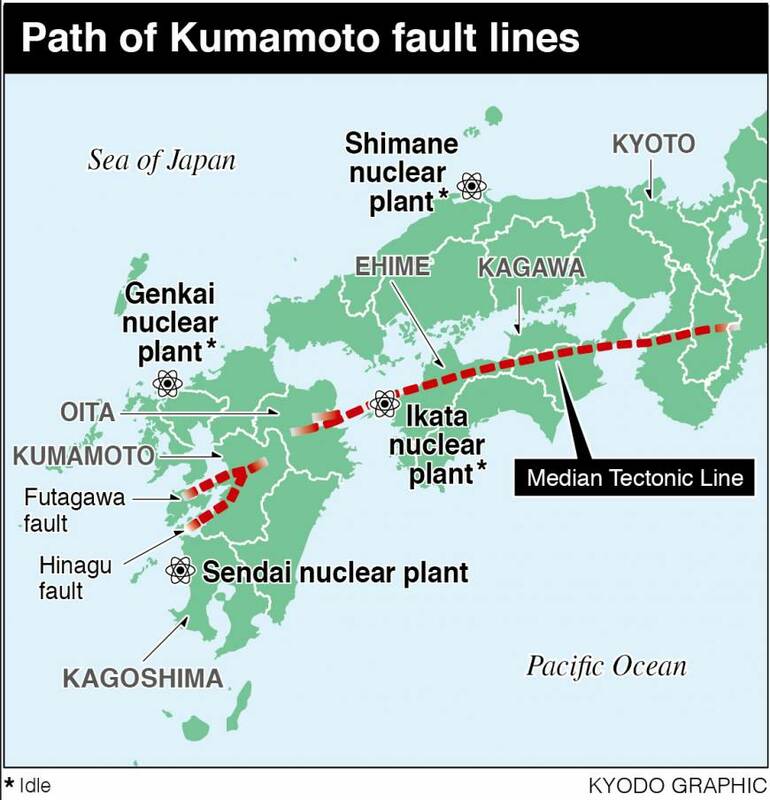 It says the focus was 12 kilometers deep in Kumamoto Prefecture. 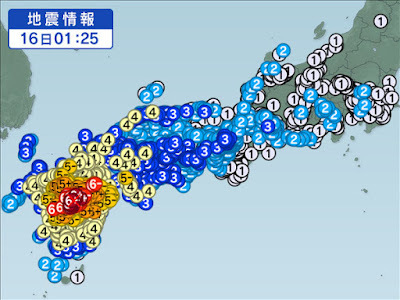 The jolt registered an intensity of 6 plus on the Japanese seismic scale of 0 to 7 in some parts of the prefecture. The Meteorological Agency issued a tsunami advisory for coastal areas of the Ariake and Yatsushiro Seas, but lifted it about 50 minutes later. A lot of severe landslides blocking roads and railways. The nearby volcano, Asosan　阿蘇山 is having a small eruption. The reactors at Sendai remain in operation. The Kumamoto castle is badly damaged, the Yagura standing here on just one pillar of stones last night, is gone now next morning. 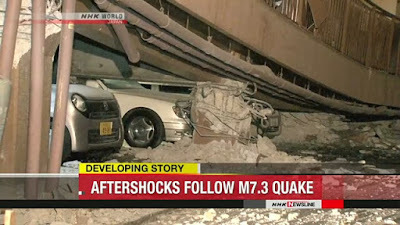 Some experts say this was just a prelude to a real big series of quakes, maybe the Nankai one. Calls in and outside of Japan are growing to shut down the nations' only two operating reactors at the Sendai plant in Kagoshima Prefecture. 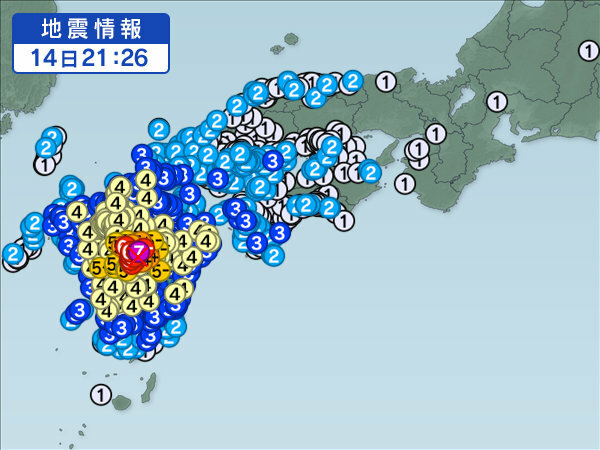 Since Thursday, the Meteorological Agency has recorded nearly 530 quakes at level 1 or above on the Japanese intensity scale in Kumamoto and Oita Prefectures. This includes more than 80 registering a 4 or higher on the scale. 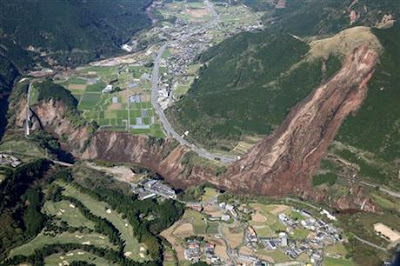 The agency has warned that seismic activity in the region may continue over the next week, possibly prompting more deadly landslides. But despite the frequency of the quakes, the Sendai plant, just over the border from Kumamoto in Satsumasendai, Kagoshima Prefecture, has continued to generate electricity since the initial magnitude-6.5 quake rocked Kumamoto on Thursday, followed by a magnitude-7.3 temblor early Saturday. The Nuclear Regulation Authority said Monday morning it had confirmed there were no abnormalities at the Sendai plant or at the nation’s other nuclear facilities. It said the seismic intensity measured by the earthquakes was well below the level at which reactors should be switched off. In addition, the NRA said, no problems were reported with the spent fuel pools at the Genkai plant in Saga Prefecture, the Ikata plant in Ehime Prefecture and the Shimane plant in Shimane Prefecture. But with continued quakes and aftershocks, fears are growing about what the constant shaking could mean in terms of cumulative damage that could result in a nuclear crisis. An online Japanese- and English-language petition by a former Kumamoto resident to shut down the Sendai plant had drawn over 42,000 signatures worldwide as of Monday morning, while anti-nuclear activists in Fukui Prefecture have also criticized Kyushu Electric Power Co. and the NRA for continuing to operate the plant. In Saga Prefecture on Sunday, about 100 mayors and town heads belonging to the Mayors for a Nuclear Power Free Japan added their voices, calling for the central government and the NRA to re-evaluate the way earthquake safety standards for nuclear power plants are calculated. They also want the government to grant localities within 30 km of a nuclear power plant the legal authority to approve or reject reactor restarts. The decision to keep the Sendai reactors running is also drawing criticism overseas. 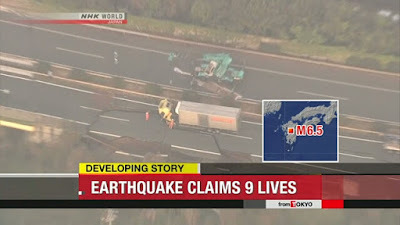 “Given the general situation on Kyushu — including the ongoing seismic and volcanic activity, the large number of evacuees, and the damage to the transportation infrastructure — I believe it would be prudent for the reactors to be shut down until conditions have stabilized,” Edwin Lyman, a senior scientist at the Washington-based Union of Concerned Scientists and an expert on nuclear materials and atomic power safety policy, said in an email to The Japan Times. In Ikata, Ehime Prefecture, Shikoku Electric hopes to restart the Ikata No. 3 reactor by this summer. 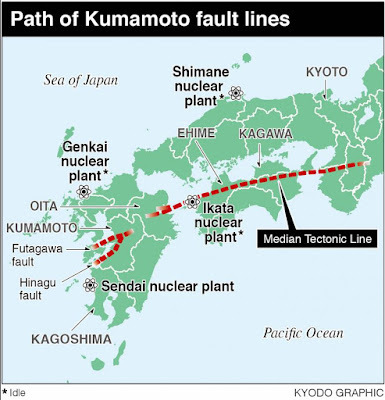 But the revelation that the plant lies near the same fault line running through Kumamoto, the Japan Median Tectonic Line, the possibility of a disaster caused by a quake has locals concerned, especially about damage to infrastructure damage that would make it difficult to evacuate residents by either land or sea. In light of the continued quakes and concerns by locals, political leaders in the area who OK’d the restart are likely to face intense pressure to rethink their stance. Sharing what we can !
. . . Navigate this BLOG . . .
. . DIARY - My Daily Report . .
. Month 05 and later .
. GABI on facebook .
. Happy Haiku Gallery . Search This Blog Only !
. Follow this BLOG .
. TOP of the daily reports .
. World Kigo Database . 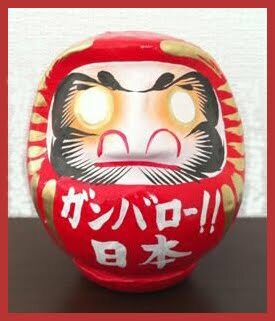 Keep going, Japan ! Seven times down, eight times UP !